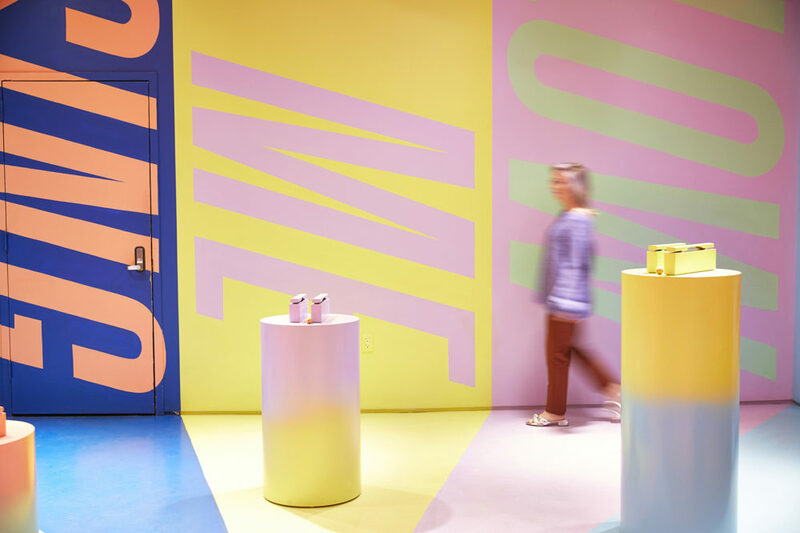 New York City’s year-old Color Factory is a museum of sorts. But patrons quickly realize it isn’t your typical museum experience. A video lays out the ground rules: Touch the art, eat the art (when appropriate), post pictures on Instagram — and get ready for a no-holds-barred deep dive (literally!) into the world of color. The museum is the second of its kind in the United States, with the first located in San Francisco. And it features the commissioned work of local artists who focus on bringing color to urban spaces. Everything in the museum is carefully curated, from the hue of the ice cream to the tint of the walls. And the experience continues beyond the museum when, at the end of the tour, visitors are given maps with locations of urban oases of color where treasures are carefully hidden away for them. Artist Erin Jang is a designer at the museum who helped create its eye-catching exhibits. “We walked through every street in Manhattan, from the very top to the southern tip, and we collected color and took photos and said, ‘What is color in New York City?’ A city that is normally defined by blacks and whites and grays,” Jang says. 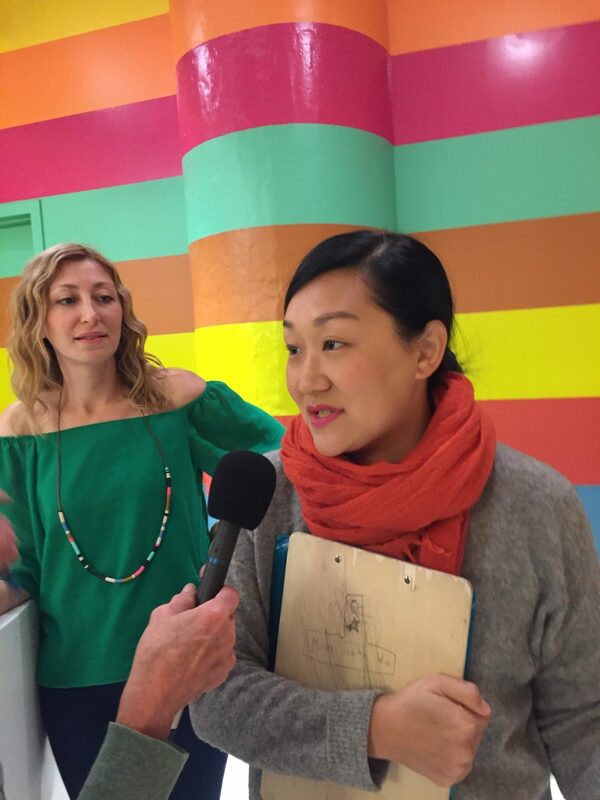 Jang, wearing a vivid saffron colored scarf — nearly matching a stripe on the wall next to wear she stands — explains that her immersion in color has caused her to look at the city differently. Fetell Lee says we have 18th-century German writer Johann Wolfgang von Goethe to blame for our current ambivalence toward color. 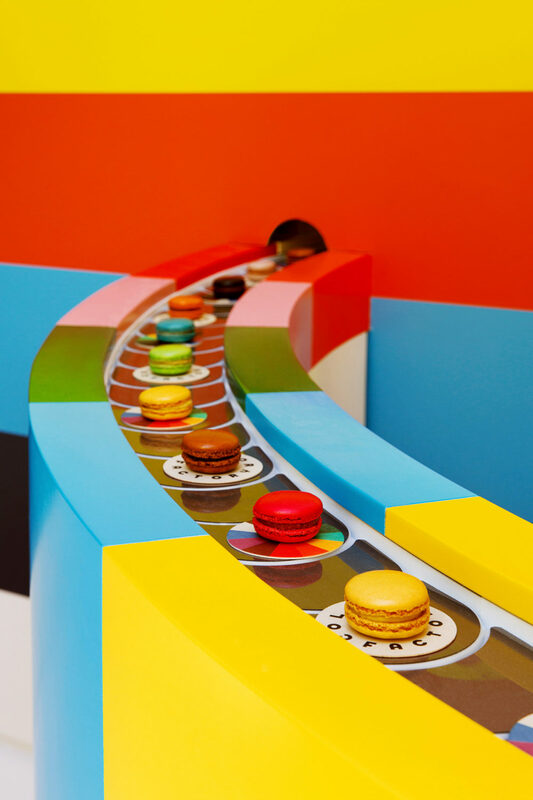 After walking through a room with walls plastered with flower people, museumgoers arrive in a room with a Willy Wonka-like carousel of macaroons. Jang says the exhibit is part of an attempt to engage all the senses — in this case, having patrons imagine what color might taste. The macaroons passing by are a vibrant array of pinks, lavenders, yellows, greens and blues. Visitors next pass through colorful tunnels, with colored buttons covering the walls. 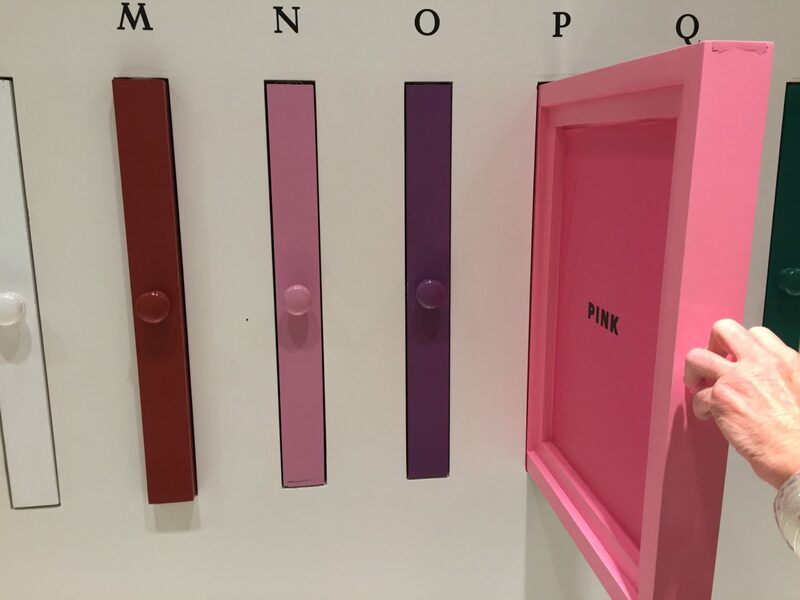 There are 26 colors, and guests are asked to pick a color they naturally gravitate toward. Later in the visit, they’re told they’ll find out more about the color and the unusual history it might have. The buttons are affixed to the visitors’ clothing, and they move on to the next exhibit. 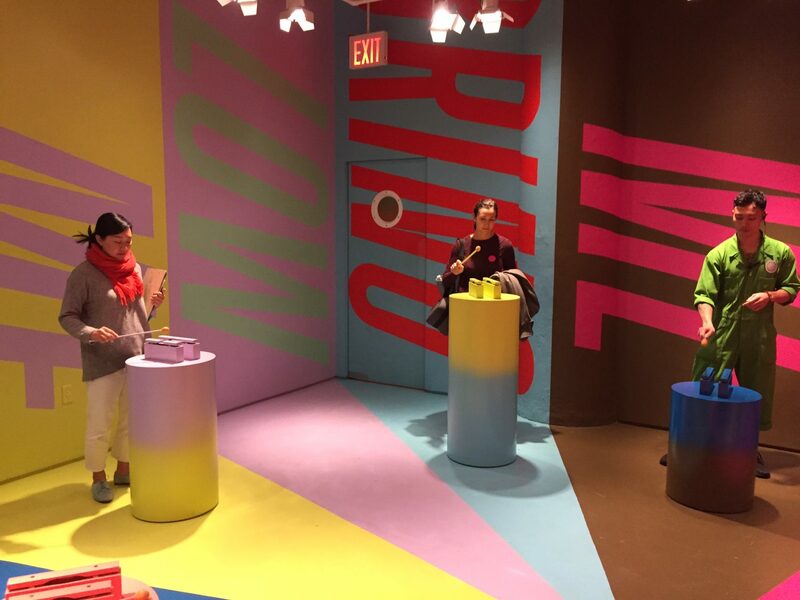 After tasting color, visitors aren’t surprised when they’re asked to explore what color might sound like. That’s done in a room decorated with murals bearing inspiring messages. The room also contains half a dozen large, xylophone-like instruments on stands, that patrons are encouraged to play. The exhibit was designed by artist Lakwena Maciver and her sister, musician Abimaro Maciver. And if sound is color made audible, Fetell Lee says color is also energy made visible. “Our color vision evolved in part to help our primate ancestors find ripe fruits and young leaves … so in some sense, the joy we find in seeing bright color is connected in a primal way to finding sources of energy,” she says. And the impact of color on society can be powerful, Fetell Lee says. She describes the city of Tirana in Albania, where a mayor with no funding decided in 2000 to paint downtown buildings with bright colors. And what happens when you emerge from the room with your color? Well, you end up on a dance floor, complete with a disco ball and a dance move to go with your color. There’s also a room by artist Andrew Kuo, who does large-scale paintings of flat color. And in the middle of the room are several spinning tables with colored sections that correspond to the paintings on the walls — all of them have to do with artist Kuo’s joys and frustrations with living in the city. 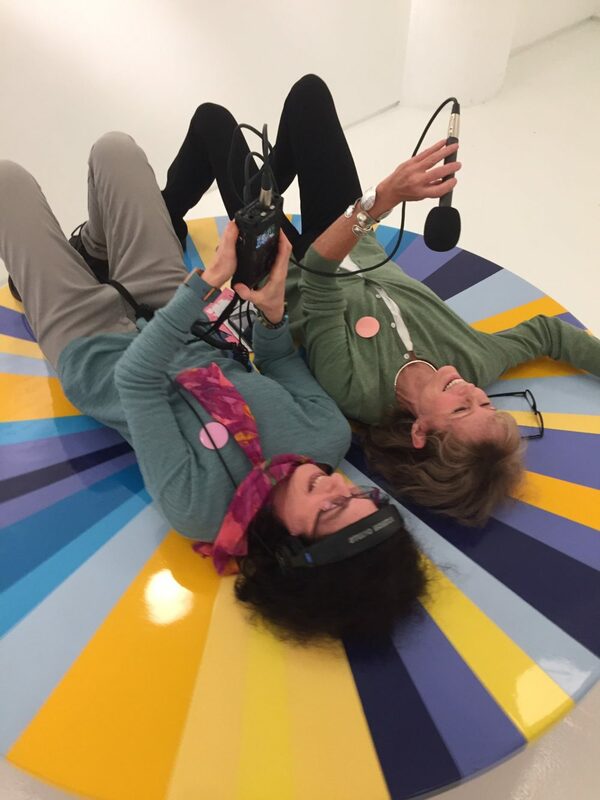 Guests are invited to lie on the spinning tables and spin — taking in color from a completely different perspective. Finally, guests end up in what looks like a giant pool — except instead of water, it’s filled with thousands and thousands of powder-blue balls, which perfectly match the hue of the walls, the ceilings and the ice cream served at a nearby counter. The pit is filled with adults, who are enjoying the tactile experience of diving into, lying on, and maneuvering through the plastic balls. 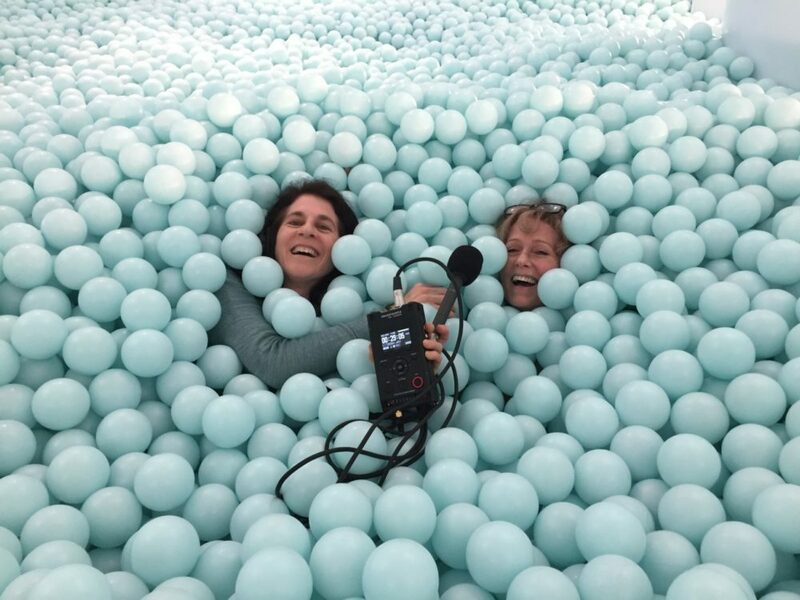 Host Robin Young and producer Karyn Miller-Medzon inside the massive ball pit at the Color Factory. “It is fascinating,” says one visitor. “It feels like water, or ice,” says another. And though it’s just plain fun, Jang says everything in the room has been placed there for a reason. The room considers the color blue and all the things it can be. “We put as much effort into making this map — almost as much effort as we took making this space,” she says. And of course, she says, like any good treasure hunt, there are prizes. In one location for example, an ATM will dispense an original work of art. That facet of the museum, like others, will be constantly changed and updated, she says. Augmented Reality is defined by the all-knowing Wikipedia as, “an interactive experience of a real-world environment whereby the objects that reside in the real-world are “augmented” by computer-generated perceptual information, sometimes across multiple sensory modalities, including visual, auditory, haptic, somatosensory, and olfactory. Essentially, AR is the real-world reality with a virtual overlap. Whereas virtual reality often blinds the user to the current world.